In this session you will be introduced to approaches in embedding student blogs into a course's curriculum and the issues involved around this. We will also cover ways you can introduce blogging into the classroom. Stappenplan voor het maken van een mindmap met Bubble.us. 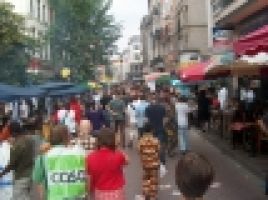 De website Muntpunt biedt uitgewerkte wandelingen aan in Brussel. Zo kan je de Matongé-wijk ontdekken en maak je onder andere kennis met de Afrikaanse en Congolese cultuur en restanten van de kolonisering van Congo. Dit educatief pakket behandelt onder andere krachten en snelheid. Vygotsky highlighted how intrinsic developmental and cultural forces interact, and as Moll concluded ‘Vygotsky's primary contribution was in developing a general approach that brought education, as a fundamental human activity, fully into a theory of psychological development’ (Moll, 1990, p. 15).